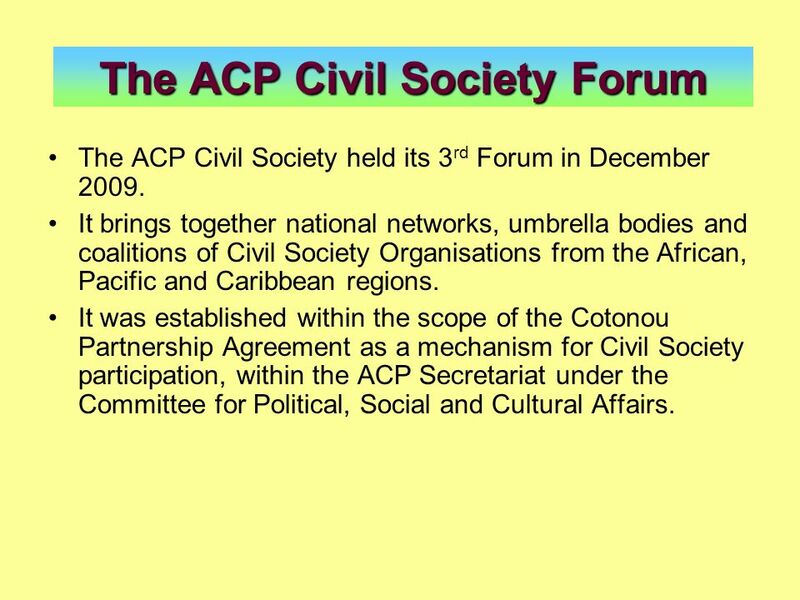 The ACP Civil Society held its 3rd Forum in December 2009. 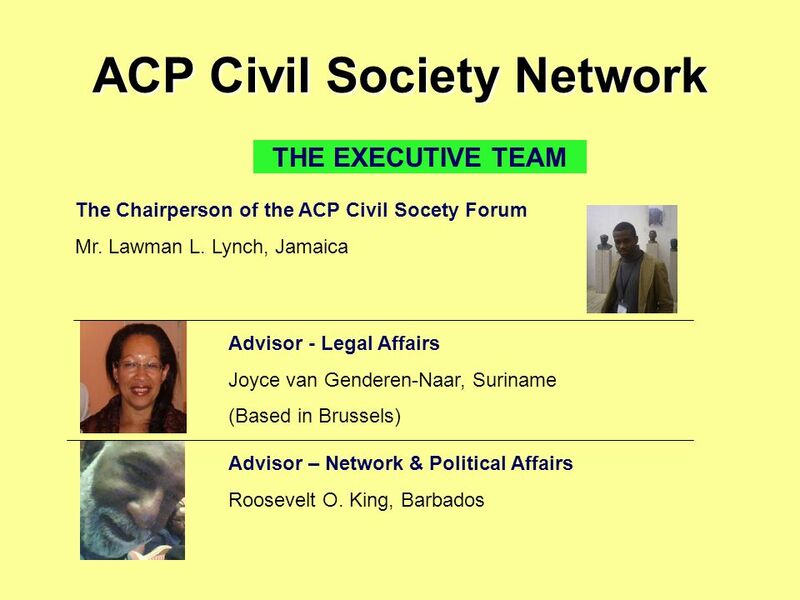 It brings together national networks, umbrella bodies and coalitions of Civil Society Organisations from the African, Pacific and Caribbean regions. 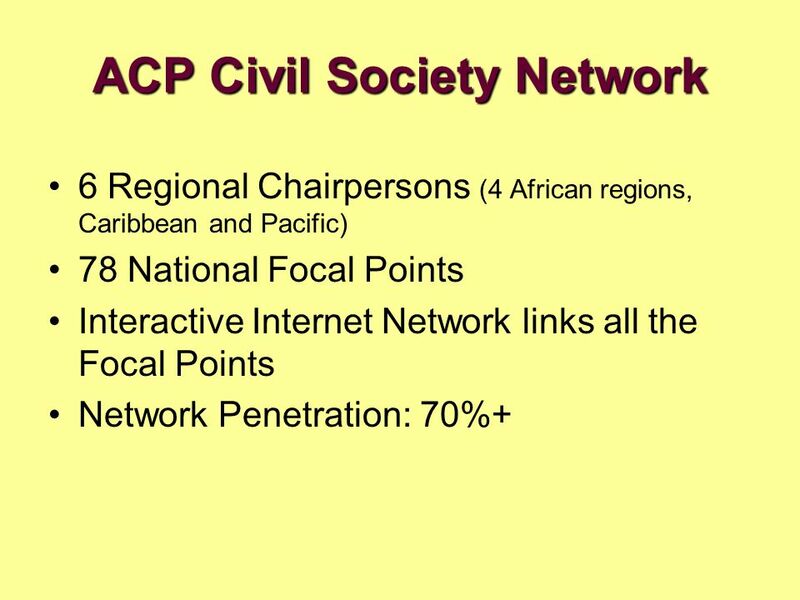 It was established within the scope of the Cotonou Partnership Agreement as a mechanism for Civil Society participation, within the ACP Secretariat under the Committee for Political, Social and Cultural Affairs. 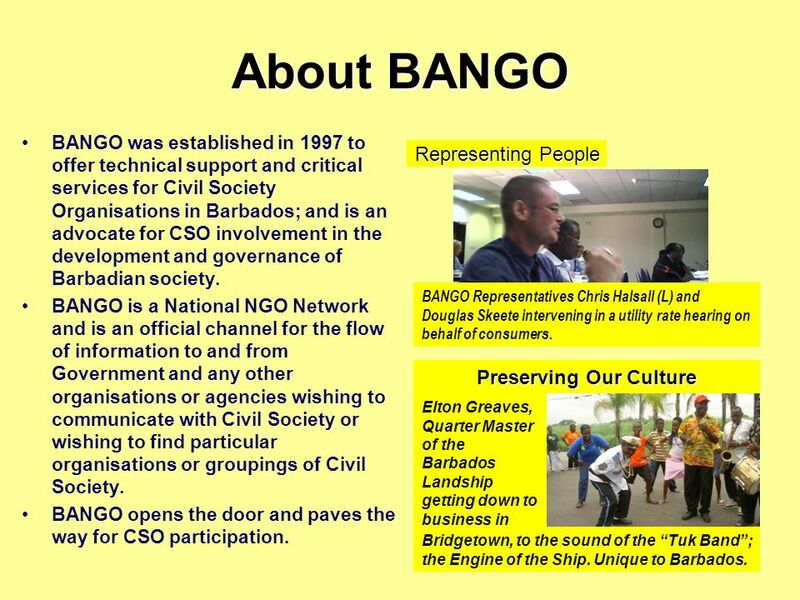 About BANGO BANGO was established in 1997 to offer technical support and critical services for Civil Society Organisations in Barbados; and is an advocate for CSO involvement in the development and governance of Barbadian society. BANGO is a National NGO Network and is an official channel for the flow of information to and from Government and any other organisations or agencies wishing to communicate with Civil Society or wishing to find particular organisations or groupings of Civil Society. BANGO opens the door and paves the way for CSO participation. Representing People BANGO Representatives Chris Halsall (L) and Douglas Skeete intervening in a utility rate hearing on behalf of consumers. Preserving Our Culture Elton Greaves, Quarter Master of the Barbados Landship getting down to business in Bridgetown, to the sound of the “Tuk Band”; the Engine of the Ship. 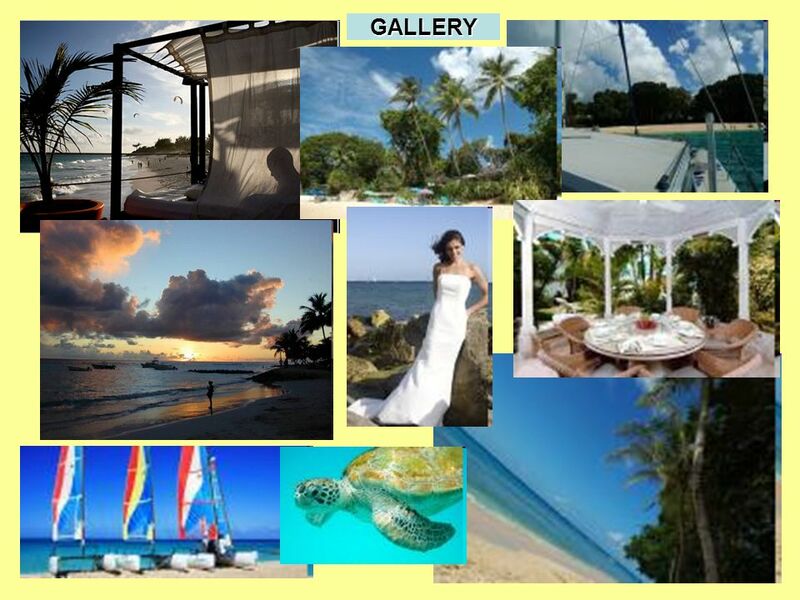 Unique to Barbados. 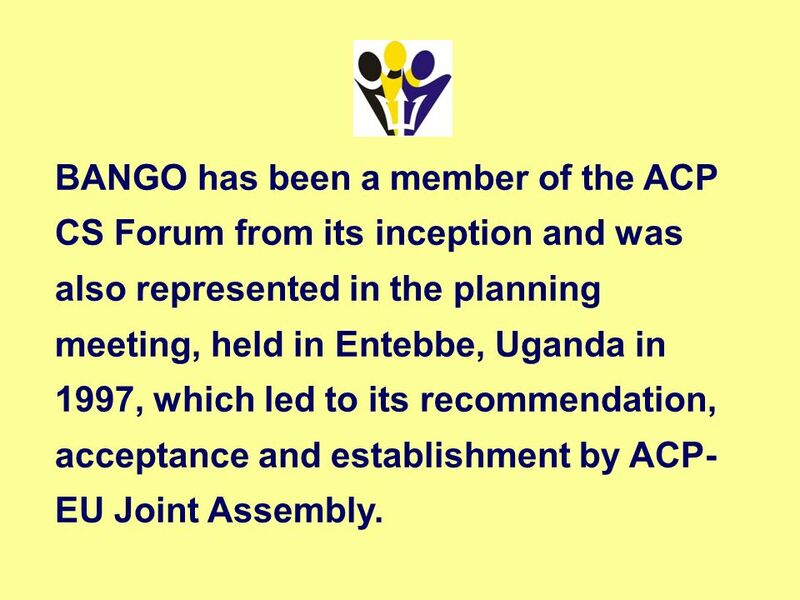 6 BANGO has been a member of the ACP CS Forum from its inception and was also represented in the planning meeting, held in Entebbe, Uganda in 1997, which led to its recommendation, acceptance and establishment by ACP-EU Joint Assembly. 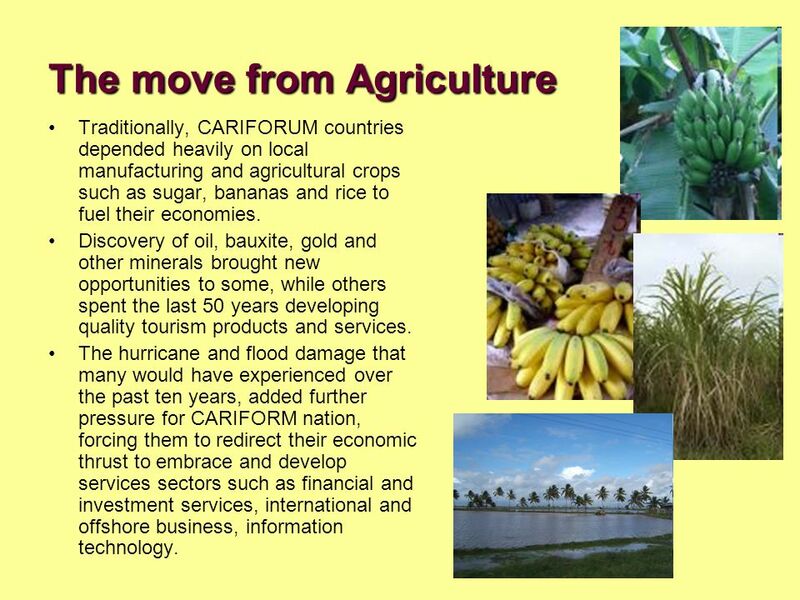 Traditionally, CARIFORUM countries depended heavily on local manufacturing and agricultural crops such as sugar, bananas and rice to fuel their economies. Discovery of oil, bauxite, gold and other minerals brought new opportunities to some, while others spent the last 50 years developing quality tourism products and services. 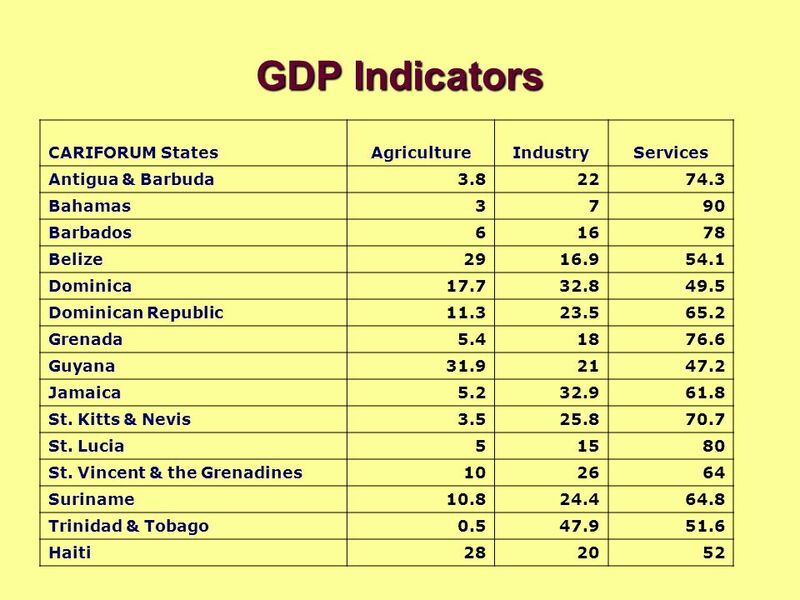 The hurricane and flood damage that many would have experienced over the past ten years, added further pressure for CARIFORM nation, forcing them to redirect their economic thrust to embrace and develop services sectors such as financial and investment services, international and offshore business, information technology. 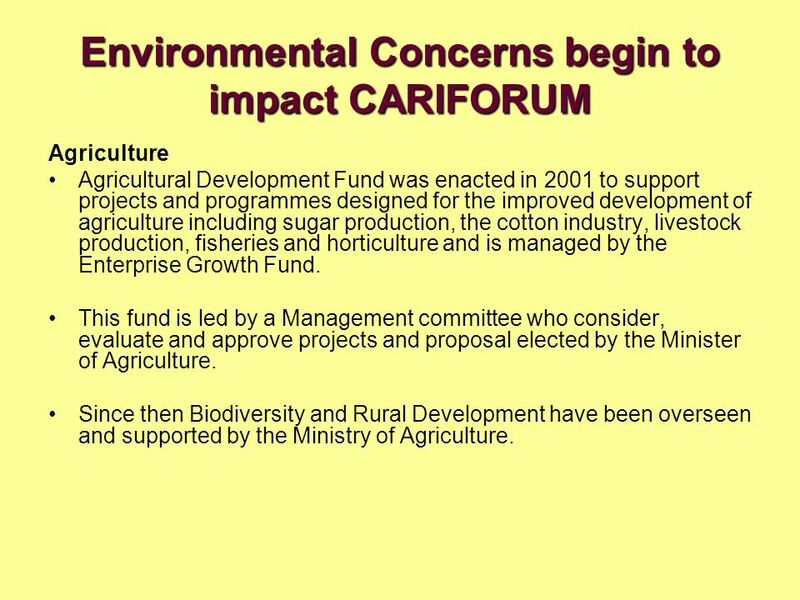 Agriculture Agricultural Development Fund was enacted in 2001 to support projects and programmes designed for the improved development of agriculture including sugar production, the cotton industry, livestock production, fisheries and horticulture and is managed by the Enterprise Growth Fund. This fund is led by a Management committee who consider, evaluate and approve projects and proposal elected by the Minister of Agriculture. Since then Biodiversity and Rural Development have been overseen and supported by the Ministry of Agriculture. 13 “The Global Economic Crisis” brought the community back to the soil. Agriculture and the environment continue to influence key decision-making processes. Barbados’ import bill continues to climb to support its growing populations and visitor demand, as local production cannot accommodate the market need. Herein lies the opportunity. With the increase in the price of oil there followed the increase in energy costs, then raw goods and materials, transportation and shipping, and hence food costs. Barbadians finally began to pay attention to what was going on around them because of one simple fact, the cost of living increased significantly. 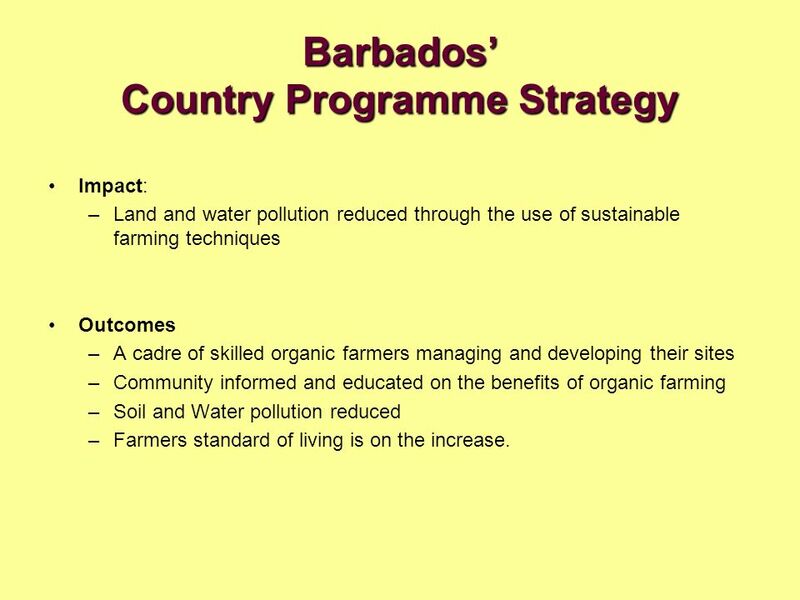 The challenge was overcoming the apathy Barbadian community had toward developing and supporting agriculture and the preservation and protection of the environment. 14 Back to Basics Government and Civil Society began focusing much of its efforts over the two years on encouraging persons to return to agriculture on a commercial and residential scale. This campaign runs in tandem with the need to protect our environment and natural resources, and the capacity to handle the transient traffic from our tourism sector. 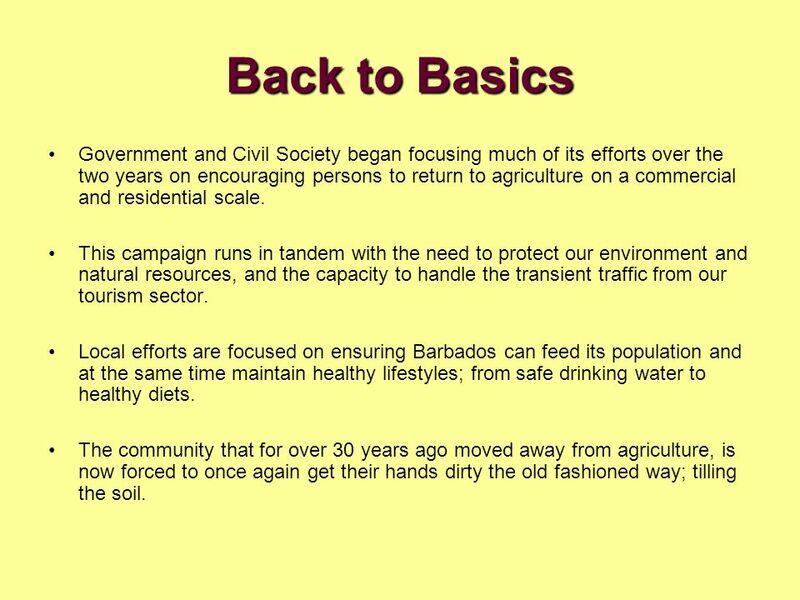 Local efforts are focused on ensuring Barbados can feed its population and at the same time maintain healthy lifestyles; from safe drinking water to healthy diets. The community that for over 30 years ago moved away from agriculture, is now forced to once again get their hands dirty the old fashioned way; tilling the soil. 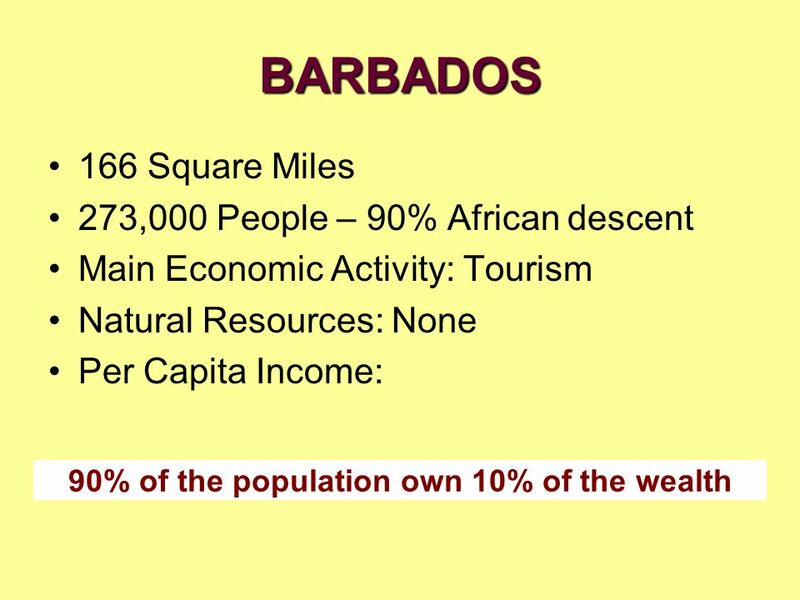 Barbados’ topography and geology have presented this island-state with numerous challenges from the soil composition to the share size of the island, by limiting what can or can’t be done and where. 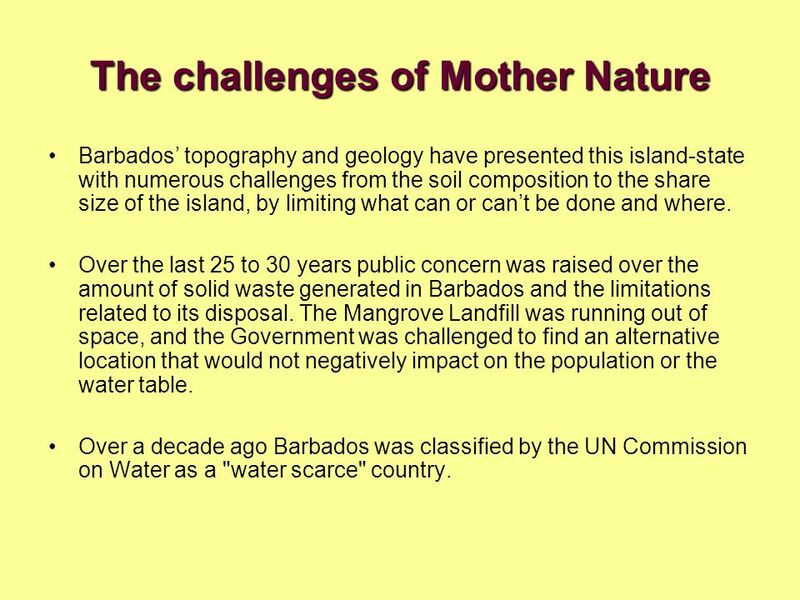 Over the last 25 to 30 years public concern was raised over the amount of solid waste generated in Barbados and the limitations related to its disposal. The Mangrove Landfill was running out of space, and the Government was challenged to find an alternative location that would not negatively impact on the population or the water table. 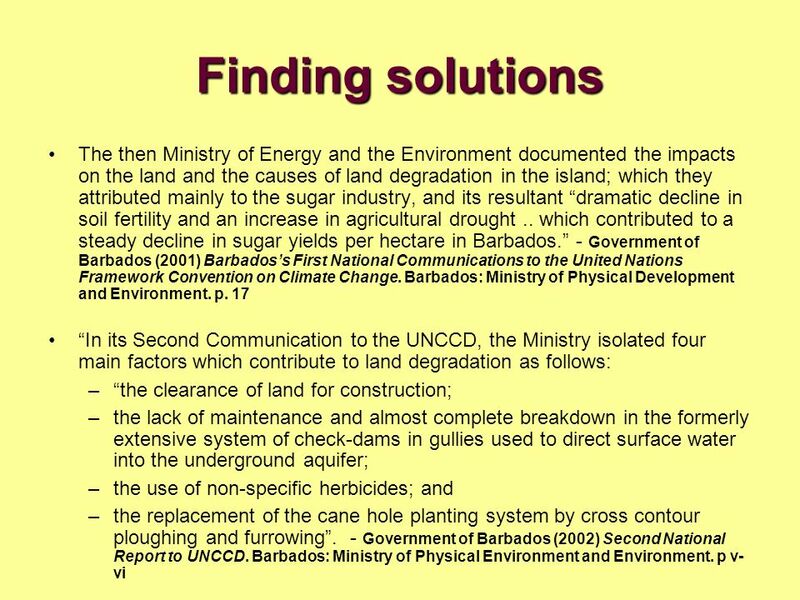 Over a decade ago Barbados was classified by the UN Commission on Water as a "water scarce" country. 17 Finding solutions From these factors one can conclude that the approach to land degradation must be holistic and integrated, incorporating environmental, physical planning and socioeconomic considerations. 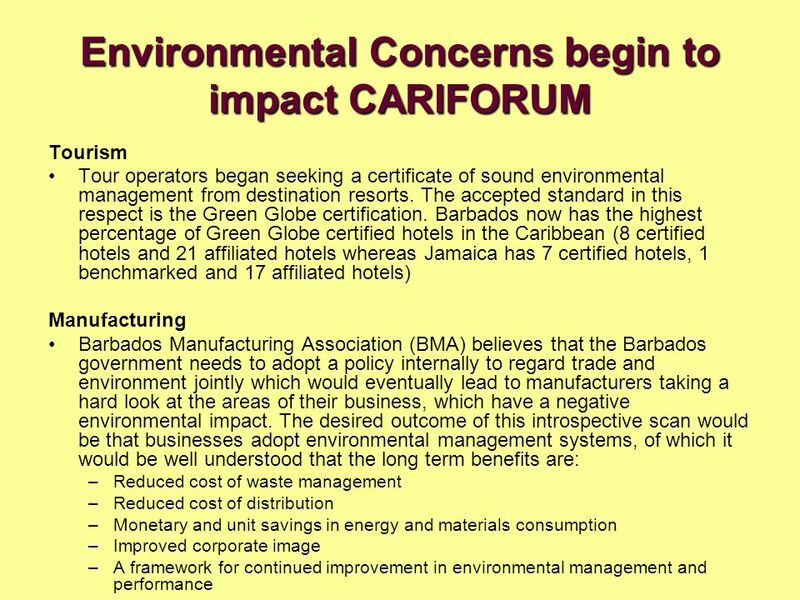 The Environmental Situation in Barbados is one in which there are signs of deterioration. 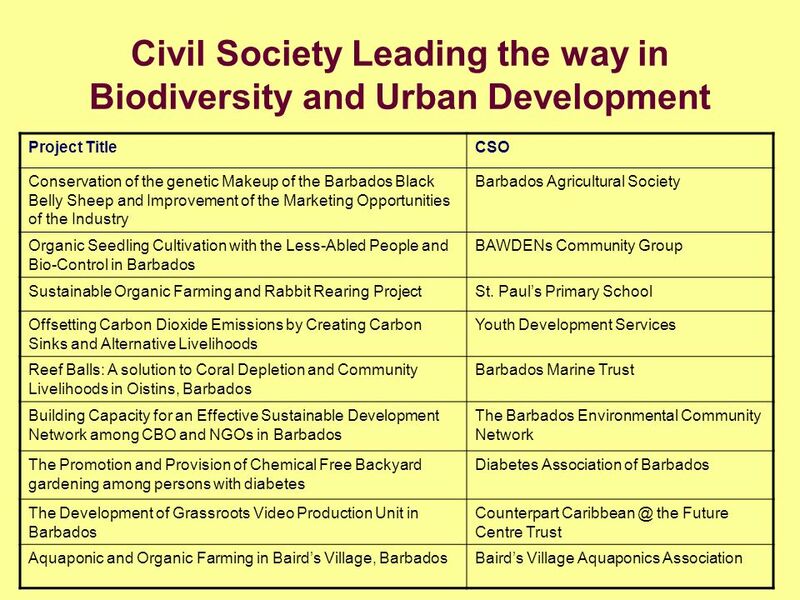 It is within this context that Barbados requires a holistic and integrated approach to environmental issues as part of its sustainable development process. With the multiplicity of well written reports, there is now a need to move from rhetoric and the written word to action. 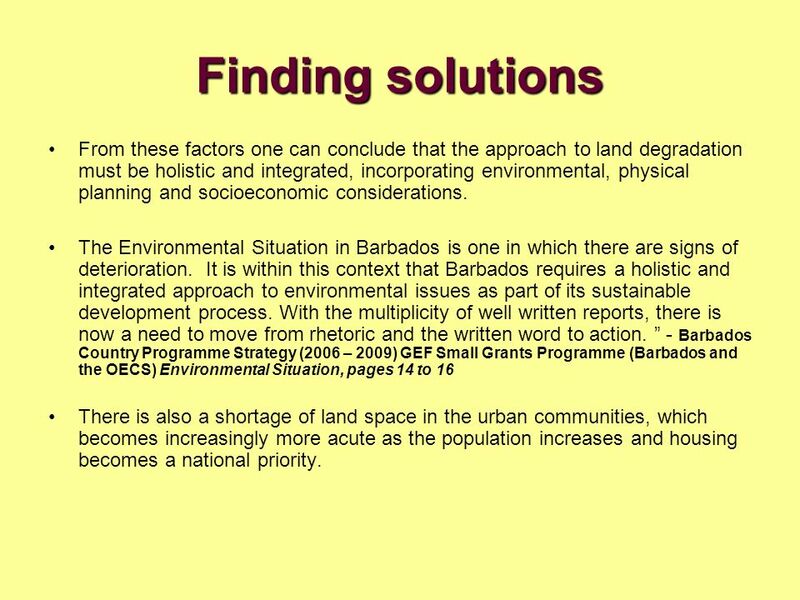 ” - Barbados Country Programme Strategy (2006 – 2009) GEF Small Grants Programme (Barbados and the OECS) Environmental Situation, pages 14 to 16 There is also a shortage of land space in the urban communities, which becomes increasingly more acute as the population increases and housing becomes a national priority. 18 Finding solutions The Ministries of Agriculture, Health and the Environment have all touted that land use has become so intense that more and more chemicals are being used to accelerate the growth of produce in as short a time as possible. These chemicals are being absorbed by the population creating health concerns. 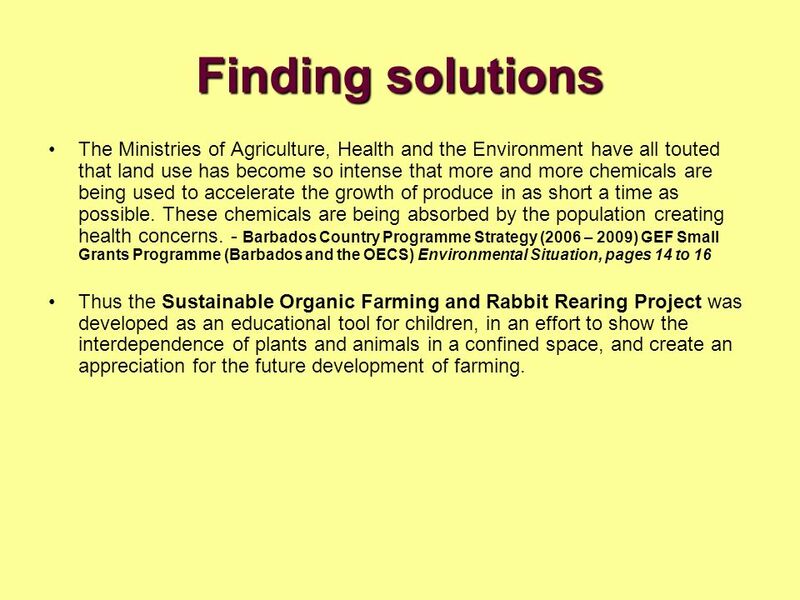 - Barbados Country Programme Strategy (2006 – 2009) GEF Small Grants Programme (Barbados and the OECS) Environmental Situation, pages 14 to 16 Thus the Sustainable Organic Farming and Rabbit Rearing Project was developed as an educational tool for children, in an effort to show the interdependence of plants and animals in a confined space, and create an appreciation for the future development of farming. 19 The Project Goals To demonstrate an integrated and a sustainable approach to organic farming in land scarce conditions in an urban environment. 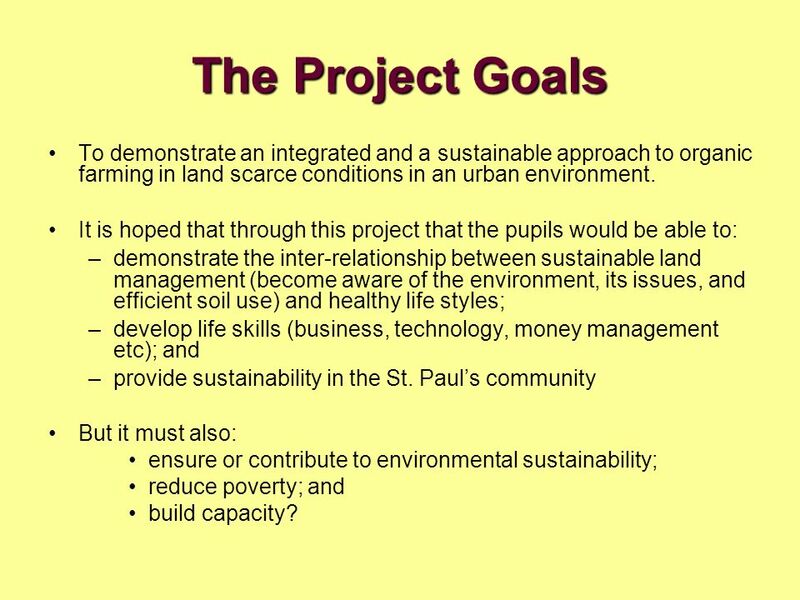 It is hoped that through this project that the pupils would be able to: demonstrate the inter-relationship between sustainable land management (become aware of the environment, its issues, and efficient soil use) and healthy life styles; develop life skills (business, technology, money management etc); and provide sustainability in the St. Paul’s community But it must also: ensure or contribute to environmental sustainability; reduce poverty; and build capacity? 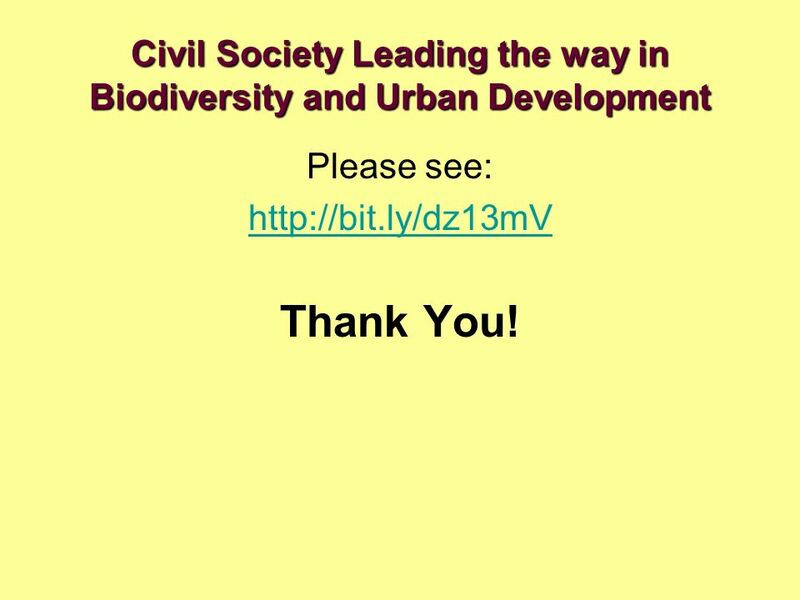 20 The Objectives Objective 1: Land degradation and organic farming - To adapt and demonstrate how organic farming methods can be utilised in urban areas where land space is limited . Outcome: Basic skills and knowledge of organic farming developed among 500 students, their parents and the nearby community. Objective 2: Learning and research - To provide a way of educating the pupils in manner that integrated all aspects of the school’s curriculum (information technology, science, health, language arts, mathematics and sign language), and help pupils to acquire skills such as project management and teamwork. Pupils would learn research skills, as the data gathered will be documented in a workbook. 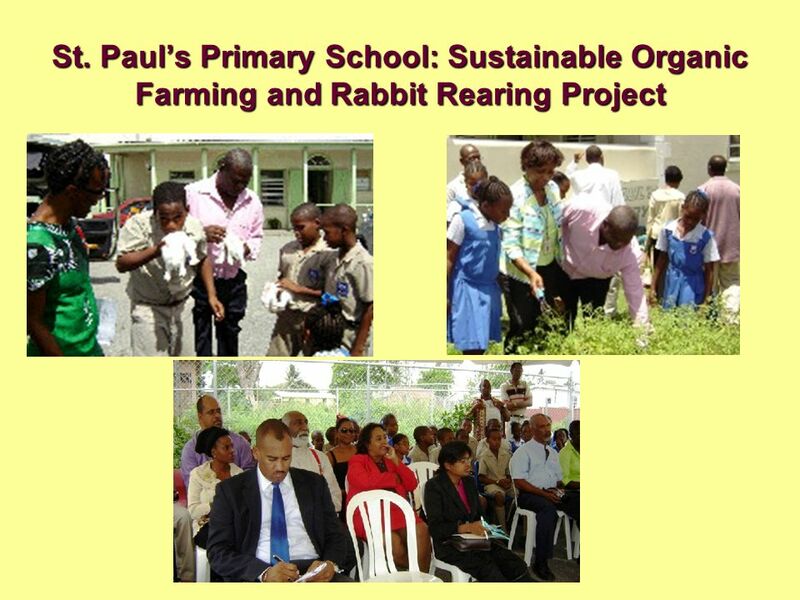 Outcome: Sustainable farming methods and skills integrated into the curriculum for student and parent learning. 21 The Objectives Objective 3: Healthy living aspects - To improve the health of students by increasing the dietary intake of vegetables and lean meat, by teaching nutrition education and conducting a pre-and post-KAP (knowledge, attitude and practices) study. Outcome: The school’s community shows a greater knowledge of the nutritional benefits of organic farming, as well as an increased consumption of vegetables and lean meat. 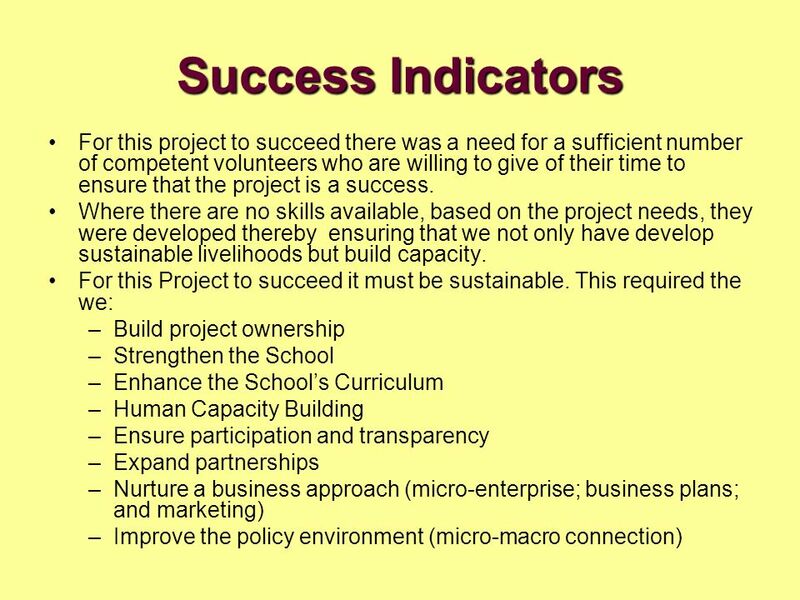 Objective 4: Public education – To create a demonstration project for the community and other schools as a means of education and projection replication. 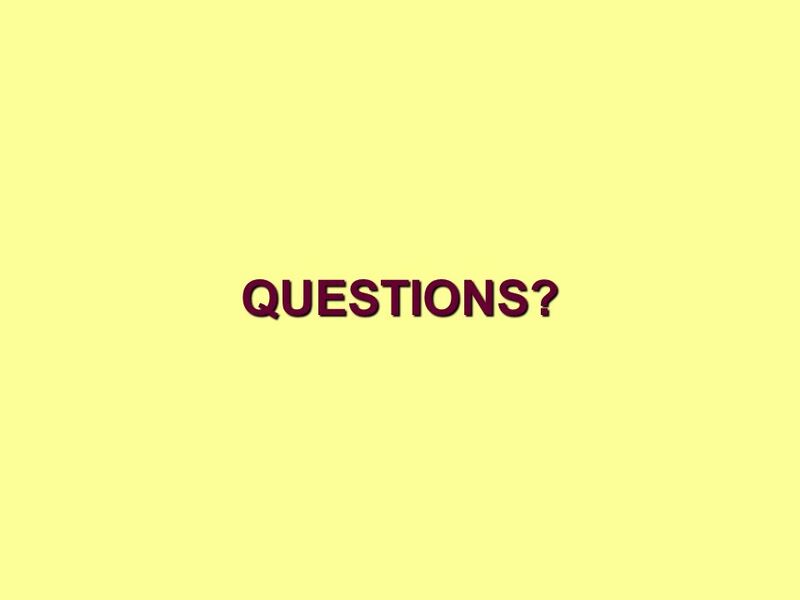 Outcome: Public is more aware of the benefits of the project by the dissemination of information and experiences gleaned by the students and the community. Impact: Land and water pollution reduced through the use of sustainable farming techniques Outcomes A cadre of skilled organic farmers managing and developing their sites Community informed and educated on the benefits of organic farming Soil and Water pollution reduced Farmers standard of living is on the increase. 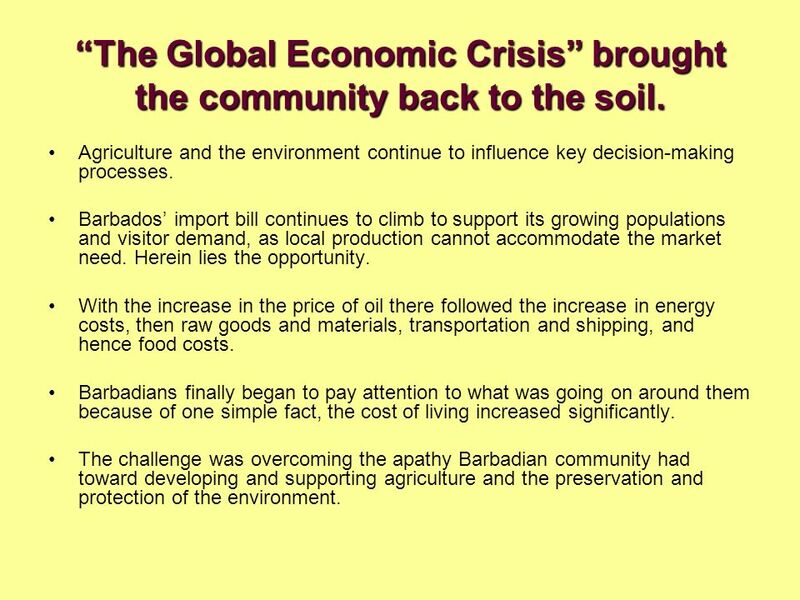 Download ppt "Barbados Association of Non-Governmental Organisations"
Linking A snapshot of challenges & opportunities for food security & sovereignty in West Africa Meredith Kushnir, REAP-Canada, Presentation for Dig In! Food crisis and the International Assessment of Agriculture knowledge, Science and Technology for Development (SSA) Dr Simplice Davo VODOUHE PAN International. Policies and Procedures for Civil Society Participation in GEF Programme and Projects presented by GEF NGO Network ECW. 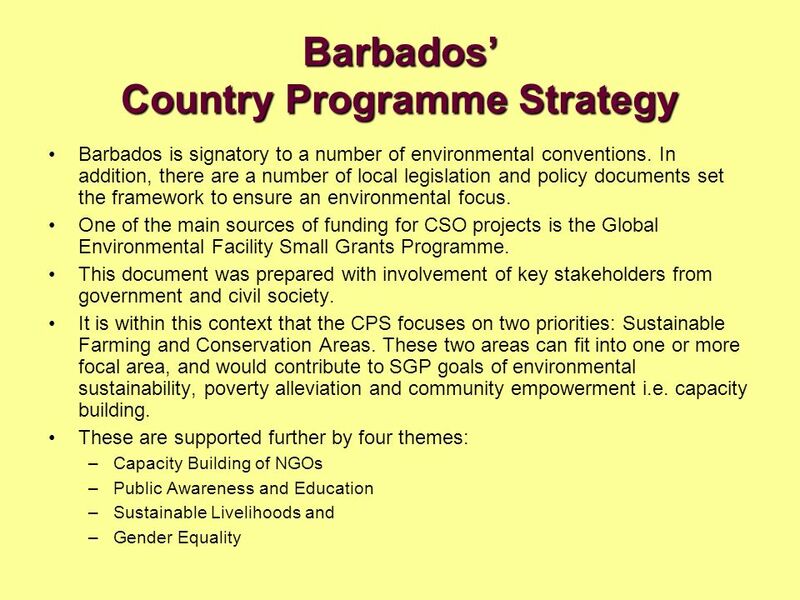 Green Economy Scoping Study for Barbados: Honing Enabling Mechanisms for Advancing a Green Economic Agenda Prepared for: The Government of Barbados Prepared. CARICOM Agriculture Donor Conference CROWNE PLAZA, PORT OF SPAIN, TRINIDAD AND TOBAGO, 2 June 2007 CARICOM Agriculture Donor Conference CROWNE PLAZA, PORT. The UNDP GEF Small Grants Programme in Kyrgyzstan Muratbek Koshoev, Kyrgyzstan GEF/SGP National Coordinator. Report on Study on Organic Rice Industry in Indonesia Written by API. 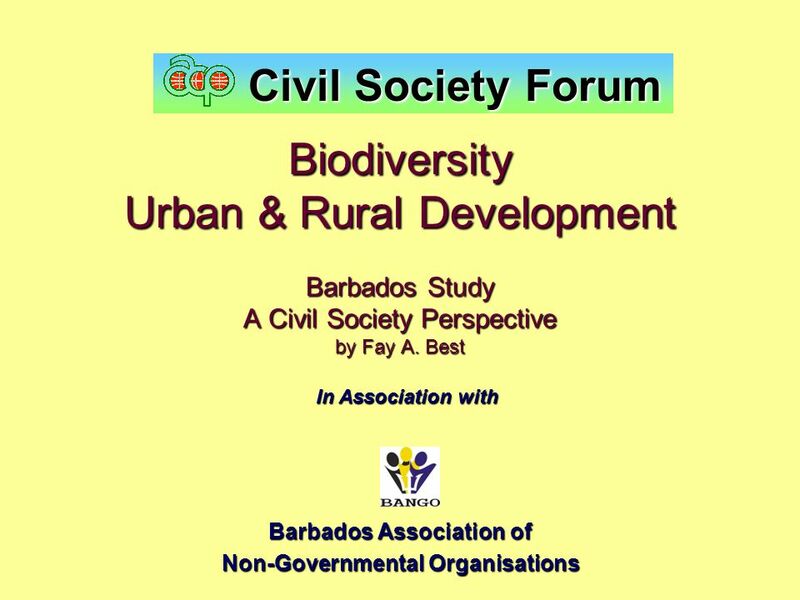 Barbados’ Green Economy Scoping Study: The Interplay of Built Environment, Land Development and Water Dr Adrian Cashman Centre for Resource Management. Prasetyadi Utomo Ministry of Environment of Indonesia CD4CDM Workshop Pathumthani, Thailand 19 – 21 October, 2005 Indonesia’s Policy on CDM Implementation.